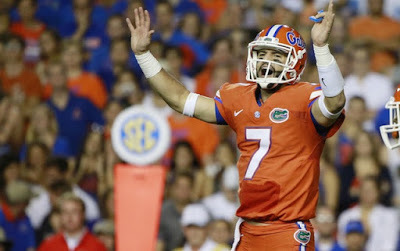 Shirts With Random Triangles: Suspended Florida QB Will Grier To Transfer To Another School. Grier, a redshirt freshman QB, was currently a serving a one-year suspension handed down by the NCAA after a test for performance-enhancing drugs came back positive. Grier claimed at the time it was due to his taking "an over-the-counter supplement." Florida head coach Jim McElwain in quoted in the statement from the school regarding Grier's decision to transfer. "Will came to me about exploring his options to transfer,'' Gators head coach Jim McElwain said. "We will support him and help him in anyway we can. This has been very difficult on him and obviously he is looking for a fresh start. "We will always be there for him as will all Gators." Florida went 6-0 before Grier's suspension. The Gators went on to finish 10-3, winning the SEC East. The team lost to Alabama in the SEC Championship Game. Florida will next face Michigan in the Citrus Bowl on Jan. 1, 2016.